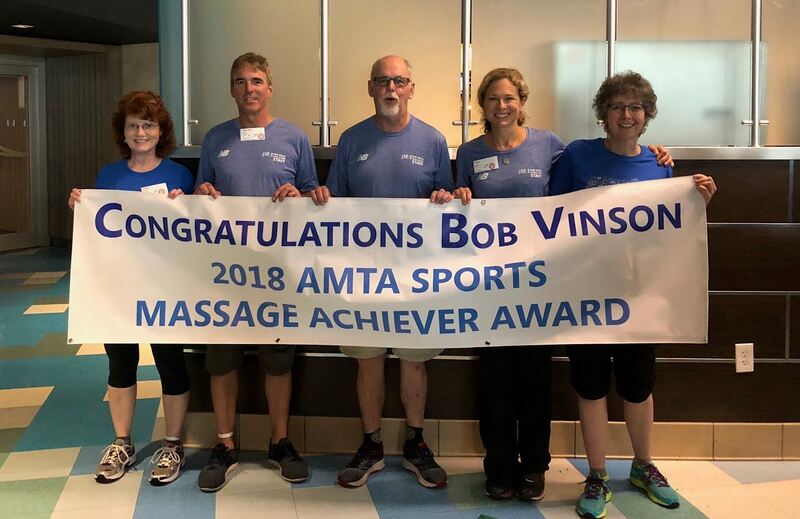 It is with our distinct honor and privilege to share with you that our very own Bob Vinson was the recipient of the AMTA's National Sports Massage Achiever Award! Bob was able to personally accept this award at the President's Ceremony during this year's National Convention. He was along side the AMTA-MA's Chapter leadership and a few members. Let us share with you what we sent on behalf of Bob when National asked us specific questions about why Bob deserved this award. We want to extend a special thanks to Katie Adams, one of our Board Members, who spearheaded the application process. It is an honor to recommend Bob Vinson for the AMTA Sports Massage Achiever Award. He has built a volunteer sports massage team for the Pan Mass Challenge (PMC) which last year topped 200 therapists, providing over 3000 sports massages for cyclists in less than 8 hours. He has been volunteering for this event for almost 30 years. It’s incredible to think about how many people have been introduced to the benefits of receiving sports massage because of Bob’s dedication to this event. The PMC is an annual bike-a-thon that crosses Massachusetts raising money for life-saving cancer research and treatment at Dana-Farber Cancer Institute. Since its inception in 1980, the PMC has contributed more than $598 million dollars to Dana-Farber, becoming the most successful single athletic fundraising event in the country. Back in the early 1990’s when Bob began volunteering for the PMC, cyclists received sports massages on foam pads in the middle of a hot baseball field at the Mass Maritime Academy on Cape Cod. Bob’s recommendations to provide tents and tables for therapists, and to organize an appointment based schedule so that more riders could receive massage instantly promoted him to a Crew Leader. He spread the word to his massage colleagues and spoke at massage schools about the event. 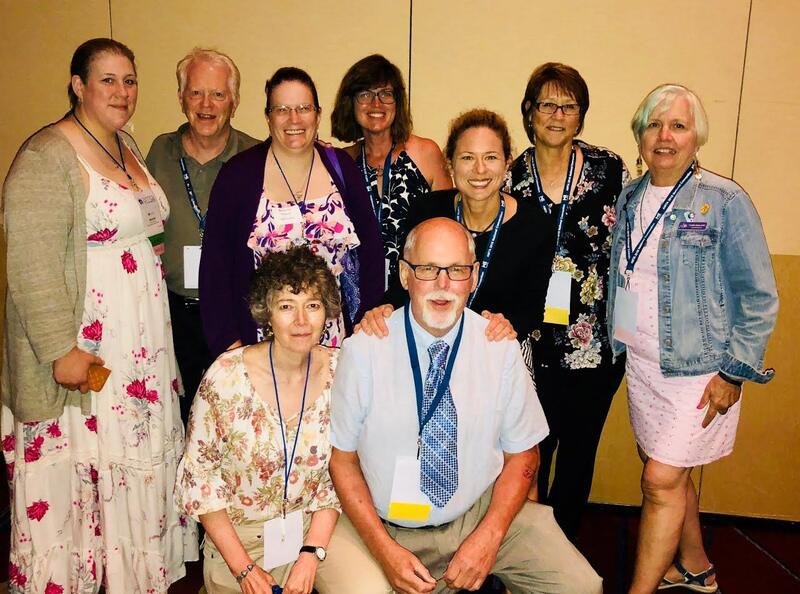 Bob built collaborative bridges between professions by recruiting physical occupational therapists to volunteer side-by-side with massage therapists for this worthy cause. Soon the crew of fifty doubled, and it has grown each year since. Working steadfastly at what the PMC calls “Table 1,” Bob treated every rider with the same compassionate touch, whether they were elite athletes, including the Tour de France winner Greg Lemond, celebrities, or first time riders. In 2016, Bob wanted to experience what the riders were telling him about – the event outside the massage room! He trained, fundraised and rode the PMC himself. But instead of getting a massage after he biked 100 miles on day one of the event, he came into the room and started giving massages. Then, at 4 am the next morning, he got back on his bike and rode another 80 miles to Provincetown at the tip of Cape Cod. Bob also volunteers as a sports massage therapist for the Dana Farber Boston Marathon Challenge, and also Suzy Becker’s Far Ride, an event to raise money, awareness and compassion for children and adults living with HIV/AIDS. Q. What outstanding characteristics or other distinguishing criteria make the nominee uniquely qualified for this award? Bob Vinson is compassionate leader, therapist, teacher and hero. His life has always been about service and compassion. He enlisted in the Army in 1967, and served in Vietnam as a helicopter pilot from 1969-1970. He flew with an Assault Helicopter Company, the infamous Ghost Riders. In addition to missions carrying troops and rescuing the wounded, Bob worked with the local people to help resettle villages and build schools. There were articles written about his service and his humanitarian efforts Reader’s Digest. After his military service, Bob graduated with a bachelor of science from UMass Amherst in 1976, and then went on to receive a Masters in Social Work from Brandeis University in 1981. He worked for the Department of Mental Health for the Commonwealth of Massachusetts, and then became an Executive Director Goodwill Industries. Back pain introduced him to the healing benefits of massage, and he decided to change careers. He attended the Muscular Therapy Institute (MTI), graduating in 1991. He wears a different Pan Mass Challenge shirt to his clinic every day. Bob says to the new PMC volunteers every year, ask the cyclist on your table why he or she is riding the PMC. It’s the stories that keep you going, even when your hands and arms and legs are tired. It’s the inspiration you receive knowing that you are a part of something bigger than yourself, and that even 15 minutes of touch can make a large difference in someone’s life. Bob offered up the coveted “Table 1” to Katie Adams in 2014. His new goal was to pass the PMC torch to a younger generation of therapists that will carry the massage crew forward and continue to foster its community and growth. His only request, to let him work at the table number according to his age and send him any riders that need his unique expertise and experience. This summer, Katie humbly watched and learned from Bob as she glanced over a sea of massage therapists towards Table 71.